Working out the quantity needed when ordering decorative aggregates can be a little tricky. Too shallow and your not going to get that beautiful covering of coloured aggregate your after. Where as if you get it too deep and your going to be sinking in your driveway like at a pebble beach. So in order to give you a helping hand we are going to explain the ways in which we would calculate the depth of your pebbles and decorative aggregates. The aggregate depth required does vary depending on the aggregate shape. “Decorative aggregates” is the term used for aggregates that are selected to look attractive. So within the decorative aggregates category on our website you will find all different types of aggregate. These include, metamorphic, igneous and sedimentary stones. When these materials are processed due to their different properties they break up in different ways. Most decorative aggregates are what we describe as “angular shape”. This is like a miniature boulder shape, being roughly spherical. However there are exceptions. 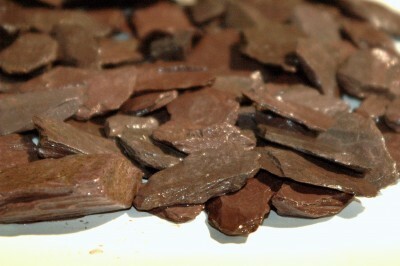 The main one being slate aggregates. Slate generally breaks into flat and slim pieces. Starting with our angular shaped decorative aggregates. Wadsworth Design generally supplies decorative aggregates in 14mm or 20mm. At Wadsworth Design we generally follow two rules. One for the smaller sizes 10mm and under, and one for the larger sized decorative aggregates; 14mm and upwards . For the smaller sizes in theory for a 10mm aggregate we would only need only a depth of around 15mm to put a complete visual covering over an area. However in practice the smaller decorative aggregates move around more under foot and when being driven on. So we would recommend a depth of about 3 times the decorative aggregate size to compensate for this movement. This means a depth of 30mm is required when using a 10mm decorative aggregate and a depth of 18mm for a 6mm decorative aggregate. As a coverage we wouldn’t recommend going much deeper than this especially if the decorative aggregate of choice is a rounded gravel, eg. Our rounded pea gravel. This is because the rounded gravels don’t lock together as well as the angular aggregates. This results in the pea gravels moving around more. If you get these too deep it can result in your drive or garden pathway having a “pebble beach effect”, where you sink into the gravel and it gets in your shoes and all over. If you require to increase the height of your drive then it should be done with larger aggregates first. Rather than using decorative aggregates. This can be done in layers, for example if you wanted the drive to raise 300mm and its just a low use driveway, the ground is relatively stable already then you could apply a 175mm layer of 40-75mm aggregate, then a 100mm layer of mot type 1 (compacted in two layers (ie 50mm laid then compacted, then another 50mm laid and compacted) and then finish off with the 25mm layer of the 10mm decorative aggregate of choice. Now moving onto the slate aggregates. These are sized in 20mm or 40mm our most popular size being the 40mm decorative slate. Slate chippings tend to be very flat. Although they might be 40mm in one direction, there depth when laid down will usually be around 5mm. This means for slate coverage the depth needs to be much less. We would recommend a depth of around ¾ the size of the slate aggregate. So if you have a 40mm slate chipping then you would only need a coverage depth of around 30mm. Obviously the above text refers to a perfect scenario where the area to be covered is level with no pot holes or undulations in the ground which is not always the case. If the area you intend to cover has undulations then you would have to make a decision over how bad the undulations are and whether or not you would need a bit more decorative aggregate than our above recommendations.